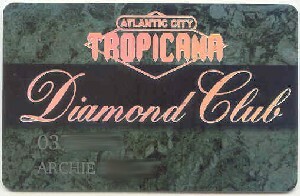 Atlantic City Hilton-VIP card. Photo of Hotel. One tower. 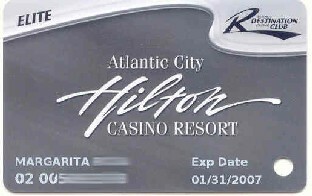 Atlantic City Hilton-VIP card. Photo of Hotel. Two towers. 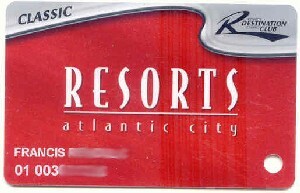 Atlantic City Hilton-VIP card. Blue. Pearl in Oyster. 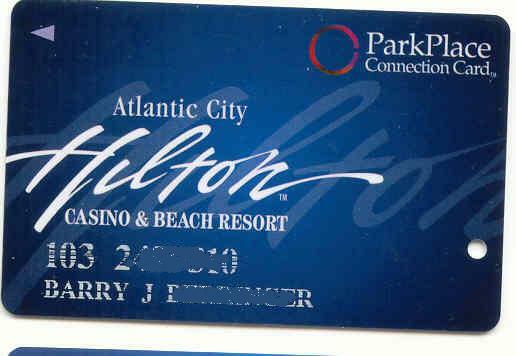 Atlantic City Hilton- Park Place Connection Card. Silver number/name. 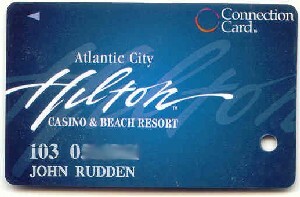 Atlantic City Hilton- Connection Card. White number/name. Atlantic City Hilton- Red. Classic Destination Club. White name/number. Atlantic Club- Grey. White name/number. Front & back. 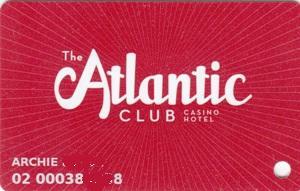 Atlantic Club- Black. White name/number. Front & back. Bally's Grand-Black. MVP. Raised name/number. 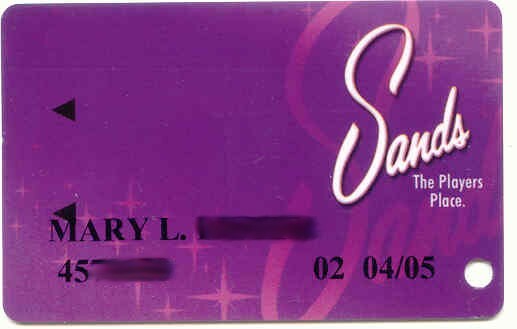 Bally's Grand-VIP card. Photo of Hotel. One tower. Bally's Park Place-MVP. Black. Confetti. A Hilton Casino Resort. 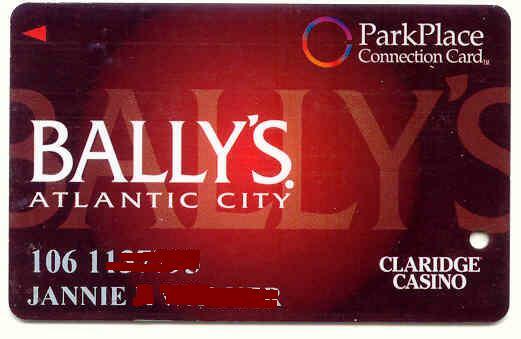 Bally's Park Place-MVP. Black. Green letters. Bally's Park Place-MVP. Park Place & Wild Wild West. 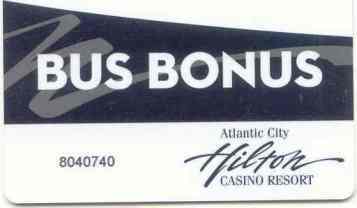 Bally's Park Place-MVP. 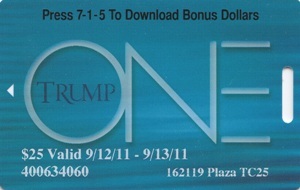 Park Place & Wild West temp card. 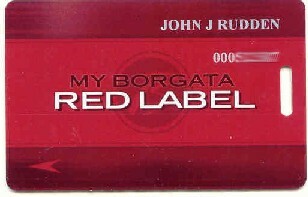 Borgata- Red Label. Silver name/number. 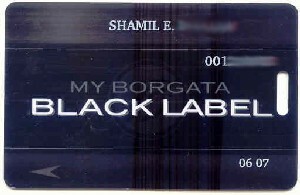 Borgata- Black Label. Silver name / number. Caesars-Qualifier-White ring around Caesars head. Caesars-Qualifier-no ring around Caesars head. Caesars-Emperors Club. Gold. Black lettering. Caesars-Emperors Club. Gold Number on right. Name on bottom left. 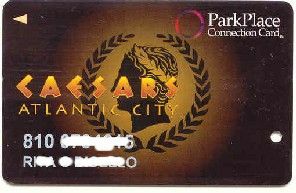 Caesars-Park Place Connection Card. Brown. 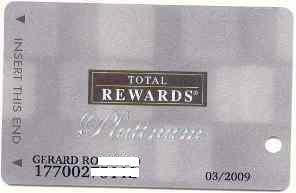 Caesars-Total Rewards Gold. 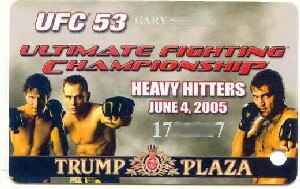 Black head Caesars logo in upper right. Claridge-Blue stars. Red bottom. 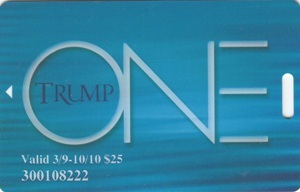 Gold Compcard, Claridge. 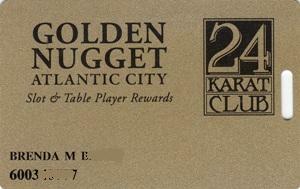 Golden Nugget- back. Same for 4 above cards. Harrah's-Total Gold. Small Total Gold Box. Resorts- Blue. 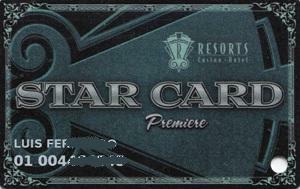 Star Card. Raised name/number. Resorts- Purple. 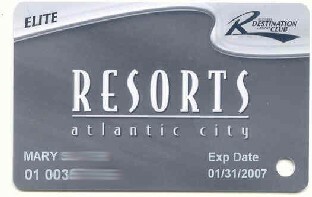 White lettered Resorts. 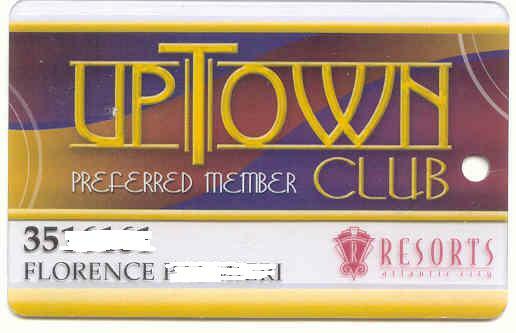 Large R.
Resorts- Uptown Club Preferred member gold. 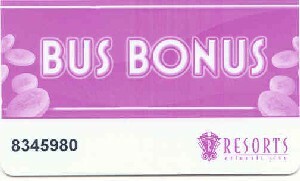 Resorts- Bus Bonus. White with purple half background. Black number. Resorts- Red. Classic Destination Club. White name/number. 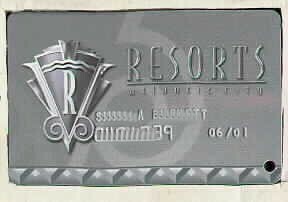 Resorts- Star card/Margaritaville. Beach. Both cards same front & back. 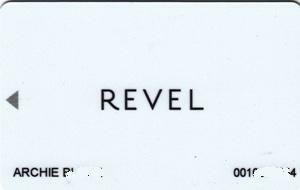 Revel- Revel Blu. Black name/number. Front & back. 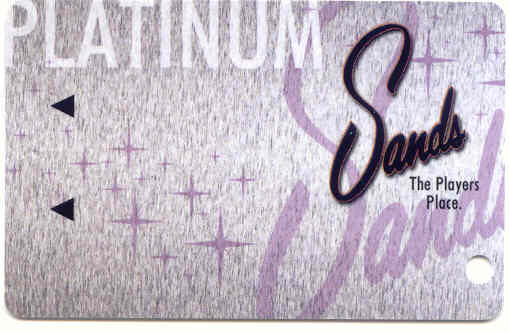 Sands-Hollywood Marquee. Gold stars. 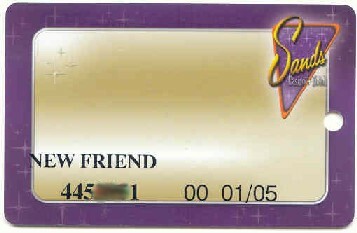 "New friend"
Sands-Dark blue. black number. No name. 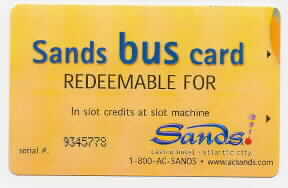 Sands-Gold reflective background. 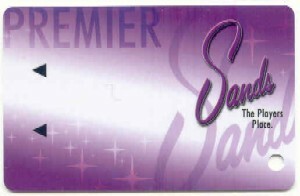 "The new age of cool"
Sands-Purple border. Platinum. Black name/number. Tropicana-Green. Silver lettering. raised name/number. Tropicana-Green. Silver lettering. 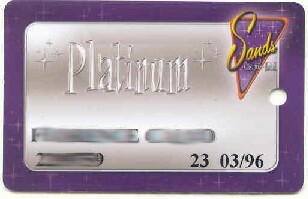 Silver name/number. Tropicana-Green. Signature strip on front & back. Tropicana-Jade Palace. Asian Table Games. 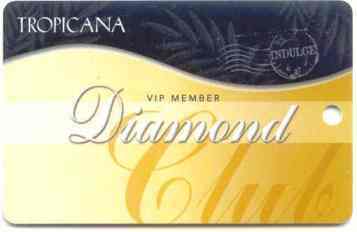 Tropicana-Diamond Club. Slightly raised lettering. Quarter on reverse. 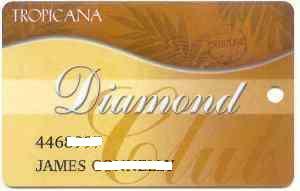 Tropicana-Diamond. Brown and gold. Black number/name. Tropicana-Advantage. Gold small font. front & back all the same. Trump Castle-Gold. 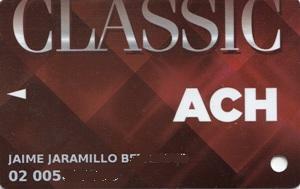 Castle card. 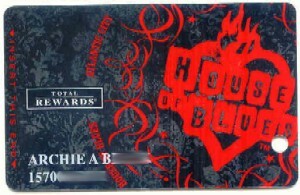 With red bar code. Trump Castle-Gold. 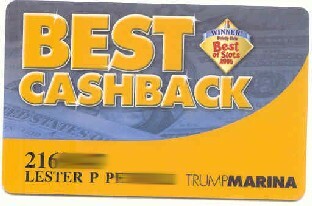 Castle gold card. Large Castle. Trump Castle-Gold. 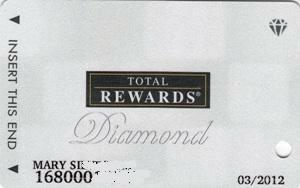 Castle Gold Card. Small Castle. Trump Castle-Blue. 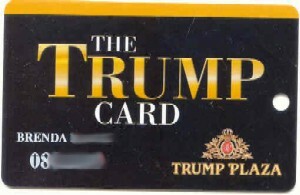 Players Card. Raised gold name/number. 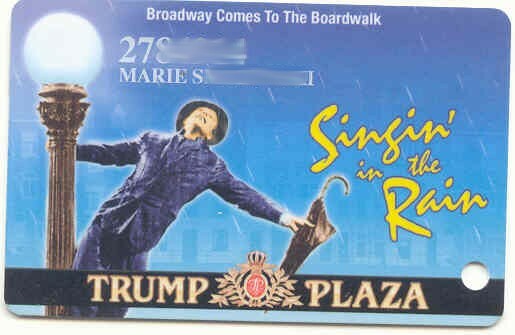 Trump Marina-Picture of ocean. 5 different Marine flags. 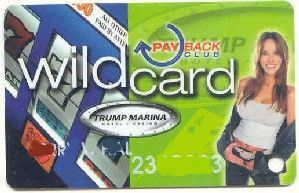 Trump Marina-Wild Card. Tiger stripes. 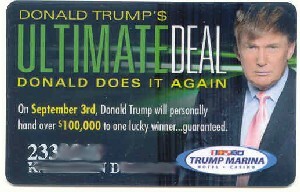 Trump Marina-Wild Card. Sky at sunset. 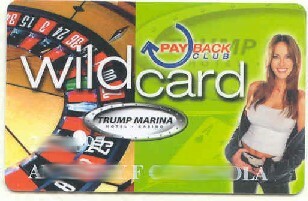 Trump Marina-Wild Card. Sunset and horizon. 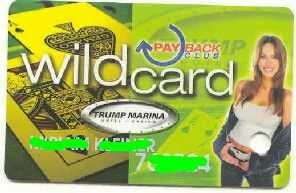 Trump Marina-Wild Card. Leopard spots. 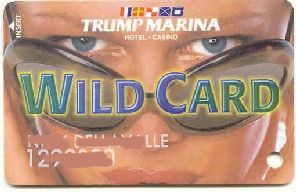 Trump Marina-Wild Card. Roulette wheel, photo of girl. 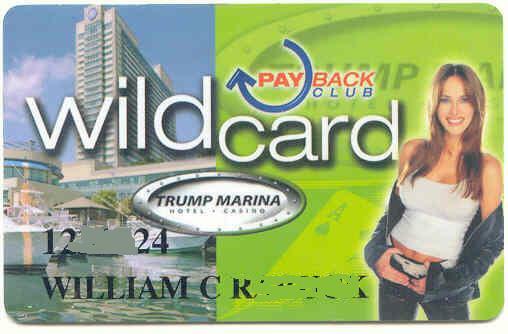 Trump Marina-Wild Card. BlackJack, photo of girl. 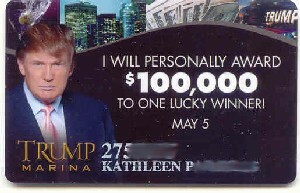 Trump Marina-Wild Card. Hotel & dock, photo of girl. 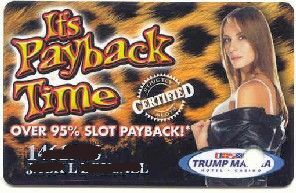 Trump Marina-Payback time. Leopard spots. 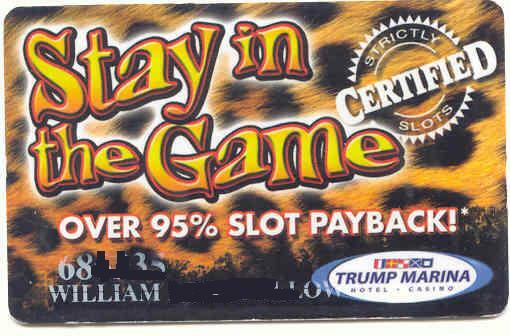 Trump Marina-Stay in Game. Leopard spots. 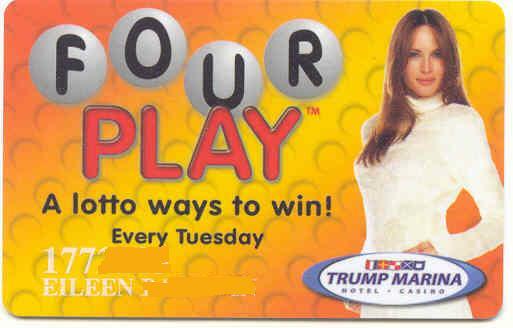 Trump Marina-Four Play, photo of girl. 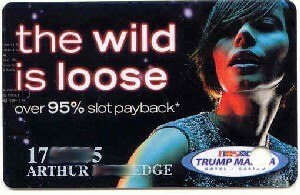 Trump Marina-The Wild is Looose. Dark background. Pic of girl. 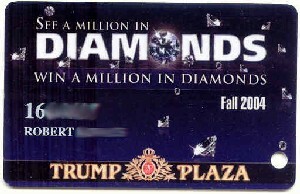 Trump Plaza-Black with hologram center. 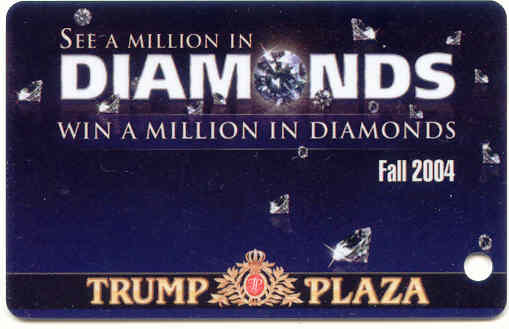 Trump Plaza-Gold with hologram center. 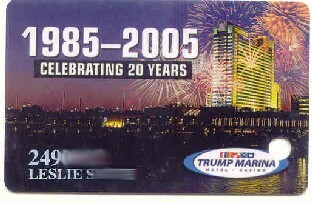 Trump Plaza-Black marble background. 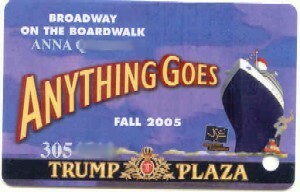 Trump Plaza logo. White name/number. 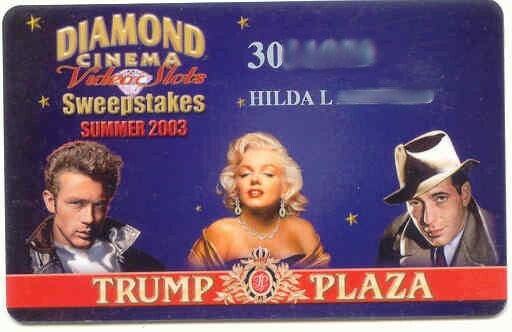 Trump Plaza-Brownish photo of Hotel, Chandelier, Slot machines. 5 Star Diamond Award. 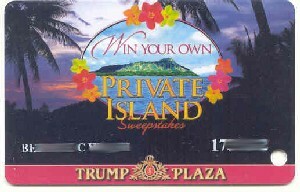 Trump Plaza-Win your own private island. 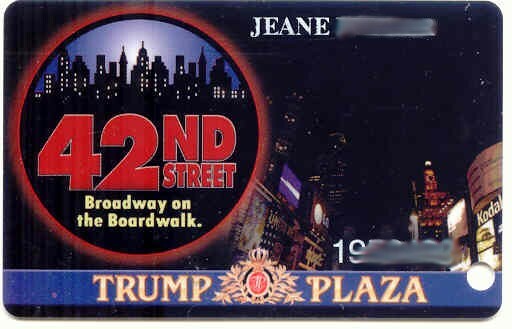 Trump Plaza-The Trump Card. Black. 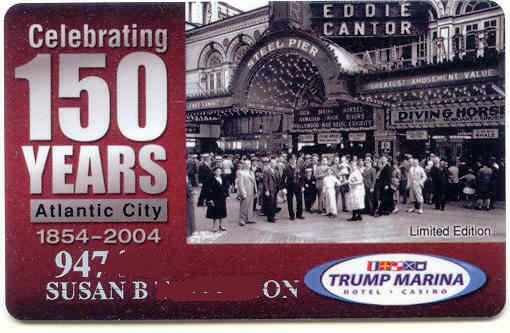 Trump Plaza-The Trump Card. Metallic brown with 2 darker brown borders. Black magnetic strip reverse. 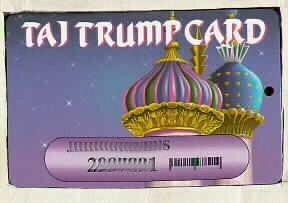 Trump Taj Mahal- Purple. Gold onion dome. Trump Taj Mahal-Green. 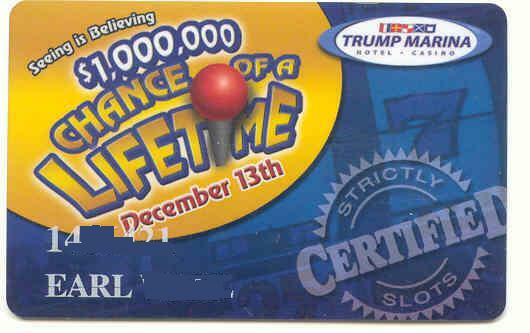 Advance Cash. 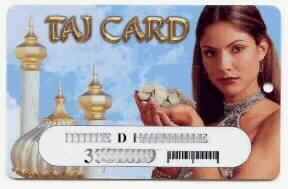 Trump Taj Mahal-Trump Card. Onion Domes. 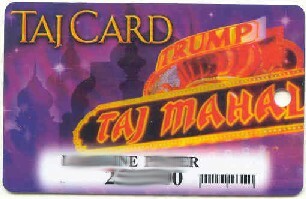 Trump Taj Mahal-Trump Card. Purple. Onion domes. 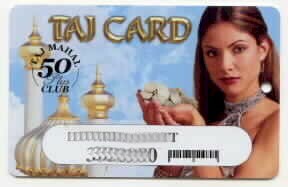 Trump Taj Mahal-Trump Card. Purple. Onion Domes. 50 Plus club. 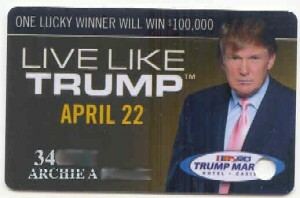 Trump Taj Mahal-Trump Card. Purple. Onion domes. Barcode next to number. 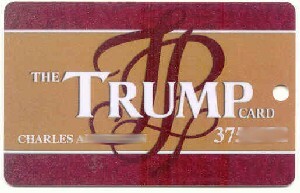 Trump Taj Mahal-Taj Card. Photo of girl, Onion domes on left. Bar code right of name. 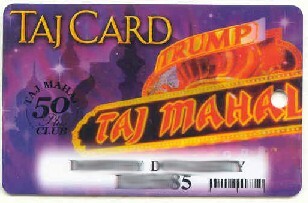 Trump Taj Mahal-Taj Card. 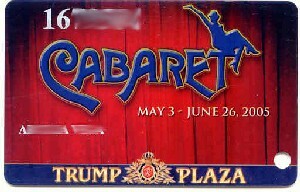 Photo of entrance sign. Black name/number. Barcode. 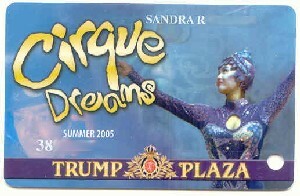 Trump World's Fair-Blue with Silver lettering. 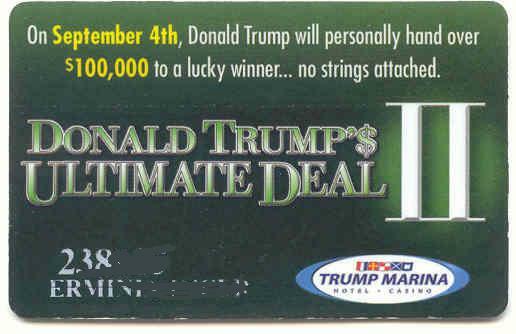 Trump One. Blue. Bonus Dollars. Press 7-1-5. $25 valid. 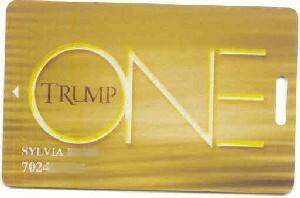 Trump One. Blue. Bonus Dollars. 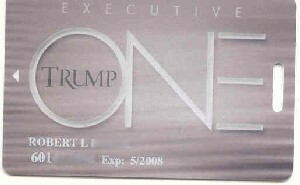 Trump One. Gold. White name/number. Front & back. 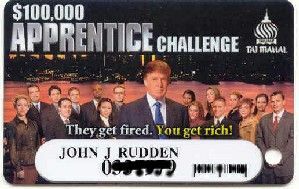 Trump One. Blue. Bonus Dollars. Press 7-1-5. Front & back.